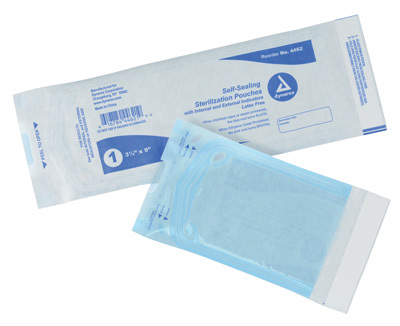 Self-sealing autoclavable pouches have blue-tinted transparent cover to easily spot contamination on the item. Internal and external color-changing indicators show proper processing in chemical vapor, steam, or ethylene oxide gas sterilization. Medical grade materials. Latex-free. Inside dimensions are 4-1/2" x 7-15/16".